The East Japan Railway Company (JR-East), as part of research aimed at developing more environmentally friendly train stations, is testing an experimental system that produces electricity as people pass through ticket gates. JR claims that this sort of human-powered electricity generation system may provide a portion of the electricity consumed at train stations in the future. 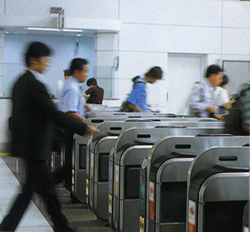 JR-East, who worked with Keio University to develop the system, claims that in addition to being put to use as an independent power supply that does not require hardwiring, the system can also be used as a way of measuring the traffic flow through ticket gates. The system is being tested at the JR-East head office in Shibuya, where it is installed at the entrance to the reception area on the 4th floor. As visitors pass through the gate, a lamp lights up, signifying that electricity has been produced. Testing of the system will continue until August 11. This just sounds silly. They can't be generating very much power, and then they waste what little they get with a lamp to show off! I am going to replace my shoe laces with piezoelectric Kynar plastic. Now, everytime I tie my shoes, I can generate power which will charge my cell phone. Just silly. If it's an LED lamp then it doesn't require very much power at all, and is inexpensive to install, to boot. With the amount of people that use the railway system I don't doubt that the devices could generate a fair amount of electricity, although I imagine a mechanical turn-stall would generate more. Could always just use both the turnstyle and the floor, maximize energy gathering.